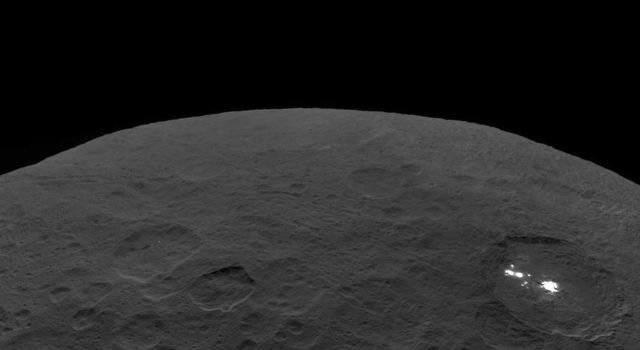 Dawn remains healthy and on course as it continues to approach Vesta. 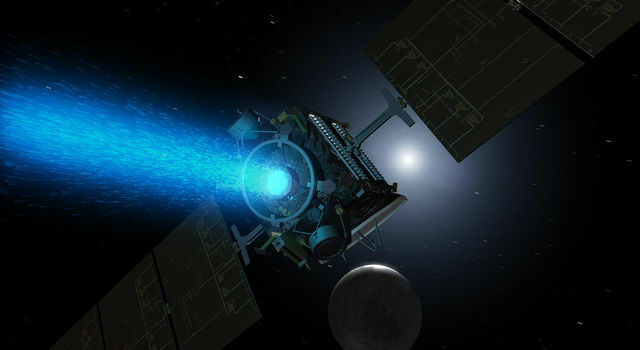 Thrusting with its ion propulsion system, as it has for most of its interplanetary journey so far, the spacecraft is gradually matching its solar orbit to that of the protoplanet just ahead. As these two residents of the asteroid belt, one very new and one quite ancient, travel around the sun, they draw ever closer. Vesta follows its own familiar path, repeating it over and over, just as Earth and many other solar system bodies do. Dawn has been taking a spiral route, climbing away from the sun atop a blue-green pillar of xenon ions. With an accumulated total in excess of two and a half years of ion thrusting, providing an effective change in velocity of more than 6.5 kilometers per second (14,500 mph), the probe is close to the end of the first leg of its interplanetary trek. On July 16 Vesta's gravity will capture the ship as it smoothly transitions from spiraling around the sun to spiraling around Vesta, aiming for survey orbit in August. For several reasons, the date for the beginning of the intensive observations there has not yet been set exactly. Astronomers have estimated Vesta's mass, principally by measuring how it occasionally perturbs the orbits of some of its neighbors in the asteroid belt and even the orbit of Mars, but this method yields only an approximate value. Because the mass is not well known, there is some uncertainty in the precise time that Dawn will become gravitationally bound to the colossal asteroid. As we have seen before, entry into orbit is quite unlike the highly suspenseful and stressful event of missions that rely on conventional chemical propulsion. 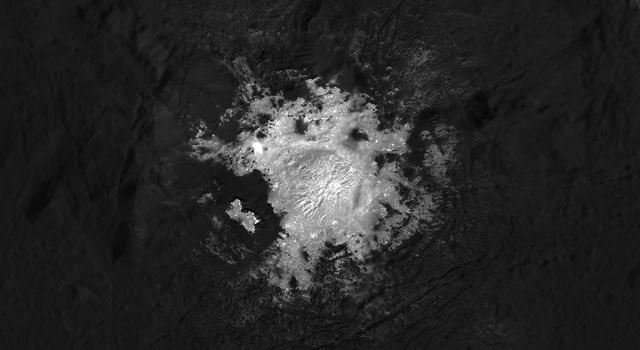 Dawn simply will be thrusting, just as it has for 70 percent of its time in space. Orbit entry will be much like a typical day of quiet cruise. That Vesta will take hold at some point will matter only to the many Dawnophiles throughout the cosmos following the mission. The ship will continue to sail along a gently curving arc to survey orbit. The bending of Dawn's path will depend on exactly what Vesta's mass is, so navigators will continue to refine the flight profile as they measure the strength of the pull it exerts. As a result, the exact date of arrival in survey orbit will not be known until the mass is determined more accurately. Indeed, although the altitudes of survey orbit, the high altitude mapping orbit, and the low altitude mapping orbit have been presented in previous logs, mission planners may target somewhat different altitudes depending on what they discover Vesta's gravity to be. There is another reason that the beginning of survey orbit cannot be specified precisely. Ion propulsion tends to afford much greater flexibility to missions than conventional propulsion does. One example of that was evident in the original schedule for the mission. When the first log (whose current price on the black market is reportedly well in excess of 2.4 percent of its original price) was written, the launch was planned for June 2007. Because of schedule changes, including those in the preparation of the rocket and the inflexibility of another deep-space mission (which did not use ion propulsion), Dawn's launch moved to September of that year. This unique mission to Vesta and Ceres, ambitious as it is, would have been possible with a launch on any day from 2005 through late 2007 because of the ion propulsion. A typical interplanetary mission has a period of a few weeks in which it must depart Earth. In many cases, controllers use this flexibility to allow the dates of key events to move based on details of the progress of the thrusting and other subtleties of spaceflight. That choice permits Dawn to squeeze still more out of the mission by, for example, spending a little extra time at Vesta. So instead of pinning down the date of survey orbit (assuming a particular value of Vesta's mass), they let it change as the mission proceeds. This strategy also makes it easier to update the flight profile as the spacecraft closes in on its destination. Navigators steer the ship toward a survey orbit with certain geometrical characteristics, such as its altitude (depending on Vesta's mass) and the angle of the orbit relative to the sun. They do not choose a specific entry point in the orbit when performing their trajectory calculations; rather, they let the trajectory calculations determine the arrival point. With each refinement, that location shifts slightly. The survey orbit observations are designed to begin after the craft has attained the correct orbit and then passes over the north pole, traveling from the night side to the day side of Vesta. Regardless of where the spacecraft arrives along the circle of the intended orbit, controllers will program it to begin surveying at that moment. Because one revolution will take Dawn almost three days, the freedom given to the mathematics of the trajectory design computer programs to determine where the probe will enter orbit can introduce a shift of that much in the timing of survey orbit. Based on the current approach trajectory, survey orbit will begin some time from August 8 to 11. The date and time will be established firmly in July. The sequences of commands to operate in Vesta orbit were designed last year with that in mind (just as they were for the approach phase), so they can easily be adjusted once the exact initial time is known. To help target the probe for survey orbit, controllers have commanded it to observe Vesta once a week since the beginning of the approach phase on May 3. As we saw that day, the pictures allow navigators to gain a better fix on Dawn's trajectory relative to Vesta. So far, the images reveal little more than the desired important information of where Vesta appears against the background of stars. And yet, in a sense they show much more. After its long and lonely voyage through the vast emptiness of interplanetary space, most of the time far from anything but bits of dust and the occasional insignificant rock, an alien world is finally coming into view. Although too far now to do more than illuminate a handful of pixels in the camera, the small disc of Vesta stands out as the brightest and largest object visible to the explorer except the master of the solar system, the sun. The pictures are visible proof of Dawn's progress from an intriguing concept not so many years ago to a distant spaceship about to orbit an uncharted protoplanet, the second most massive body between Mars and Jupiter. Dawn has traveled 2.7 billion kilometers (1.7 billion miles) since leaving Earth. Today it is only 580 thousand kilometers (360 thousand miles) from Vesta, just 1.5 times the distance between Earth and the moon. (Note: If you are in doubt about these numbers, you may confirm them by seeing the standard closing paragraph below.) Yet as the spacecraft continues to thrust during the approach phase, making the final adjustments to its solar orbit, it will travel more than 88 million kilometers (55 million miles) around the sun before Vesta captures it in a month and a half. Dawn's orbit is already so similar to Vesta's that today it is closing in at only 240 meters per second (540 mph), not even as fast as many commercial aircraft fly. That is unusually slow for the speeds typical of interplanetary travel. Meanwhile the two of them rush around the sun at nearly 21 kilometers per second (more than 46,000 mph). This is similar to what you would experience if you tried to match velocities with a car on the freeway (you probably would want to use a car yourself for such a demonstration). The two cars may be traveling at high speed, but their relative speed could be quite modest. Early in the evening of June 6, if you gaze at Earth's moon before it sinks below the horizon, you might consider that the moon is about as far from you as Dawn is from Vesta. On its way out into the solar system after lifting off from Cape Canaveral, Dawn passed the orbit of the moon in less than 29 hours. The tremendous push imparted by the Delta rocket to start the probe on its mission is quite unlike the gentle approach to Vesta. As you enjoy the sight of the moon, Dawn will have two months of flight ahead of it to cover that same distance to survey orbit, where it will begin reaping the rewards of its long journey. Dawn is 580 thousand kilometers (360 thousand miles) from Vesta, or 1.5 times the average distance between Earth and the moon. (See?) It is also 1.64 AU (246 million kilometers or 153 million miles) from Earth, or 610 times as far as the moon and 1.62 times as far as the sun today. Radio signals, traveling at the universal limit of the speed of light, take 28 minutes to make the round trip.